Love your Pokemon patterns! 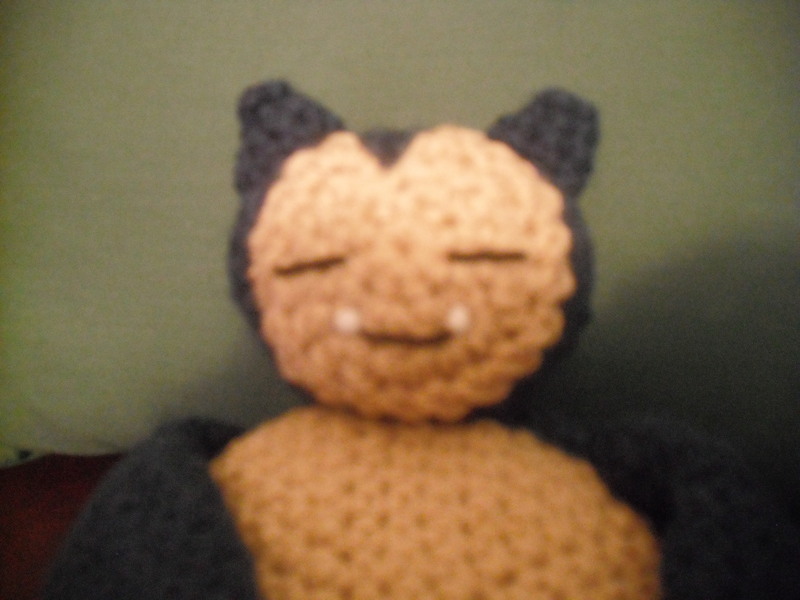 I’m working on Snorlax, but the face isn’t coming out according to your pictures. Have you done a pattern for Victini yet? I’ve had a request for that one. I don’t have a pattern for a victini, but i do want to make one. 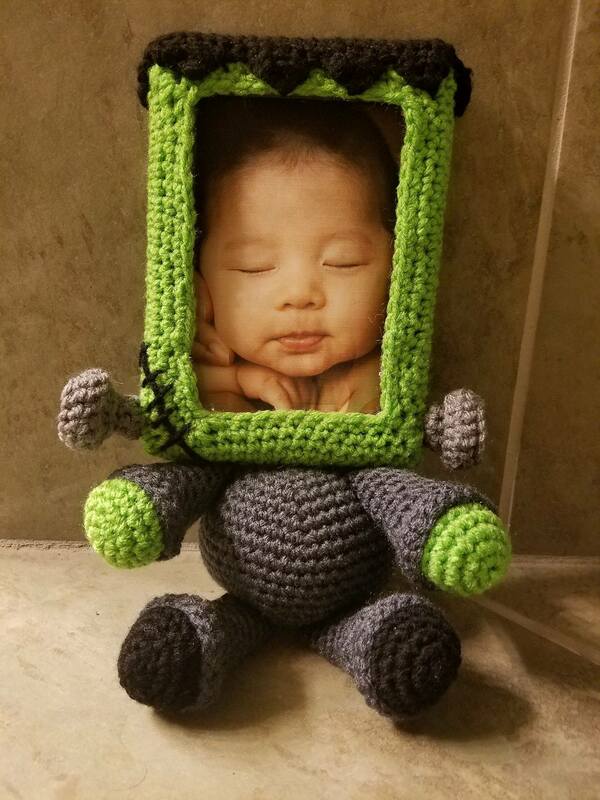 I just finished getting my Masters so I am now trying to find a job, so my crochet time is lacking. I was able to do a Victini by looking at a picture. Gave it to a little boy for his birthday last weekend and he loves it!!! Is there something missing for the pattern for the face? I don’t get the two peaks I see in the picture. Sorry it has taken me a little while to answer. My future husbands family invited me on a trip to Tennessee last week and I am just now getting back in the flow of things. So yes, turn the work again and it will give you the two separate peaks. I will go back and add that to the next round as well. Thanks for helping me make the pattern even better. I figured out that I forgot to make the turn after round 2. Am I supposed to turn again after round 3? 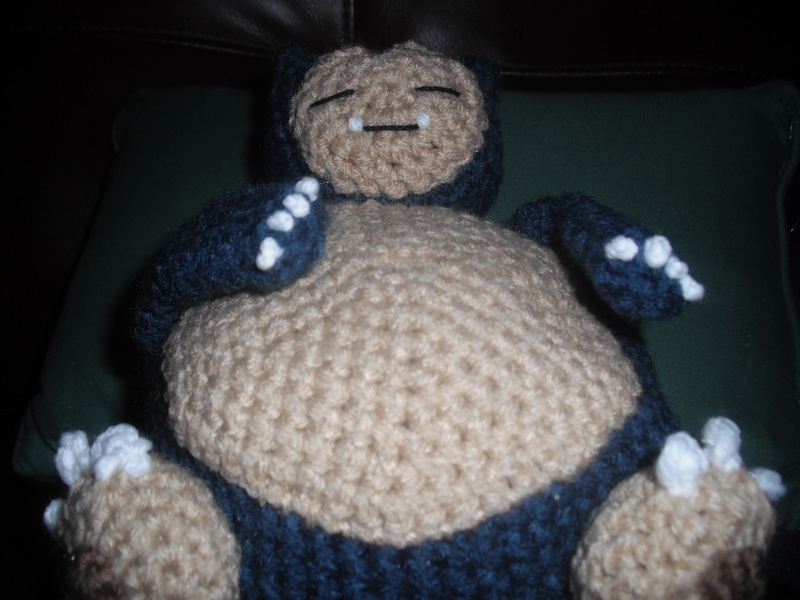 I’ve been looking for a good project for a while now, and came across this adorable Snorlax~<3 I'm still a bit new to crocheting but this will be a fun challenge! Thanks for sharing this with the world! Hi! 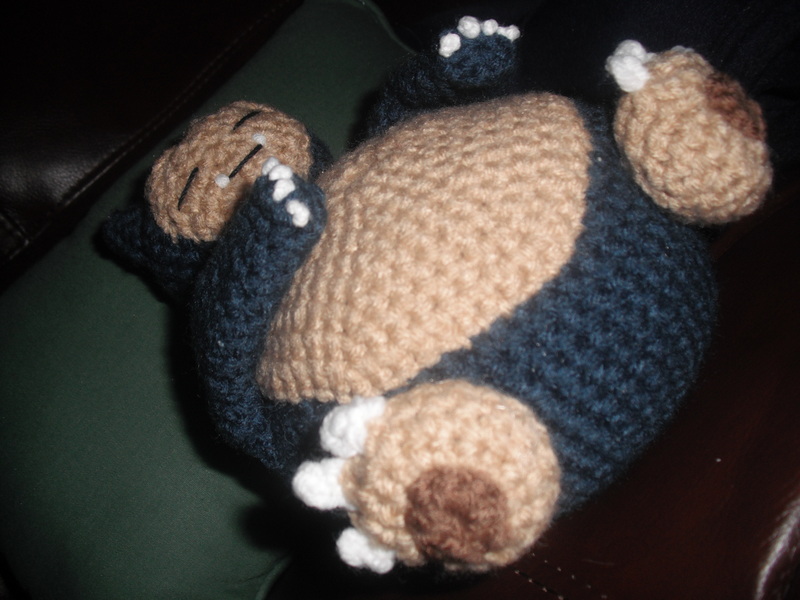 I’m making this Snorlax as a gift, but the face isn’t working. Your pattern says to sc 8 in the mr, but after increasing on the second round there should be 12. Plus there doesn’t seem to be enough loops to come out with 20 in the end. Please help! Thanks, I realized that it should have said 16 instead of 12 for the number of stitches in the second round. Then if you follow Round 3 you will have enough loops. Follow either one, and it will work. This second one tells you what to do for each loop. I hope this helps! Round 3: sc, sc, 2 sc in next sc, hdc, hdc, 2 hdc in next sc, sc, sc, sc, sc, 2 hdc in next sc, hdc, hdc, 2 sc in next sc, sc, sc. Thank you, thank you, thank you!!! You are absolutely amazing with your creative ideas and putting them into patterns for the rest of us. I’m so happy to have found your web site!!! Especially your Pokemon creations! 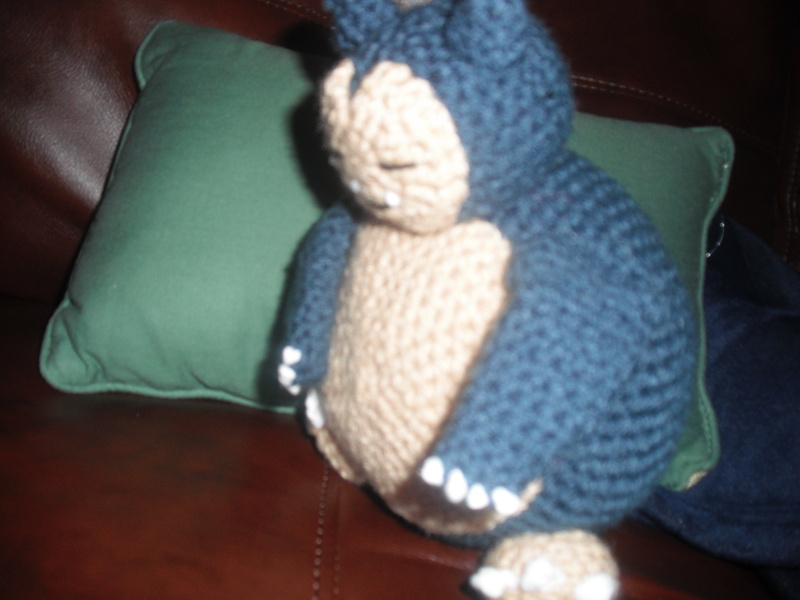 I used your patterns for Pikachu, Charizard, and now Snorlax. I really can’t thank you enough for these patterns. I really have to tell you though that I figured some changes for your Snorlax pattern for body and belly, and foot pads (brown) and feet (buff). 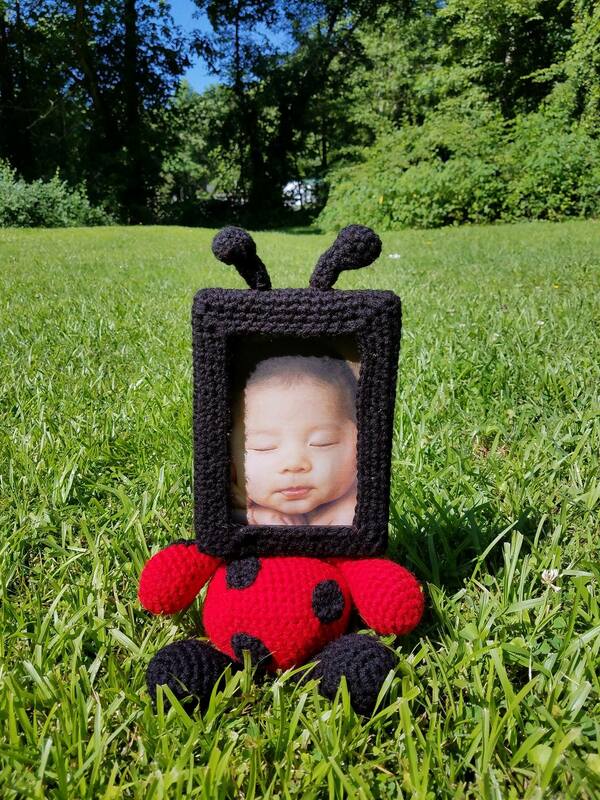 I think you’ll like my ideas, its less yarn, less work, and no sewing extra parts together. You gave me the patterns, least I can do is share the short-cuts. Belly (buff) and Body (blue/grey) crochet as one piece. F/o, leaving a long enough tail to fill in gaps so stuffing doesn’t show through. Foot pads (brown) and feet (buff) crochet as one piece. By the way my grandsons ages 15 years, 18 years, and 26 years thank you too! I made changes to your pattern. 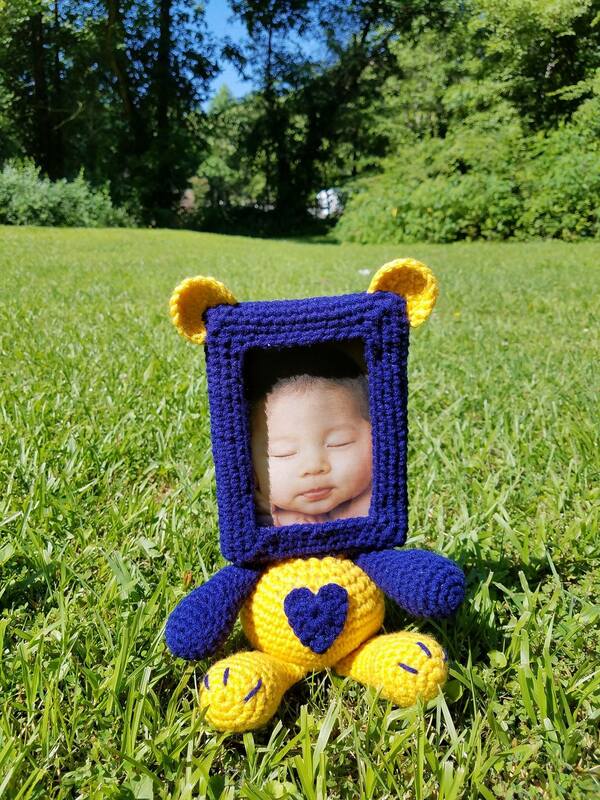 I simply changes when to change yarn color to be able to crochet the Belly (buff) and Body (blue/grey) crochet as one piece, and the Foot pads (brown) and feet (buff) crochet as one piece. You are the genius pattern writer! I thank you soooo much for your wonderful patterns. I’m having so much fun with them. Round 5: *sc 3, 2 sc in each sc* around (30)” mean?